With the real-estate market getting more competitive again, finding the right price point when you are selling a home is getting even more important if you don’t want to leave a good chunk of money on the table. Traditionally, finding that price point has been a question of looking at recently sold houses and a good bit of divination from your real-estate agent. In a fast-moving market, however, comps may not tell you the whole story. To help homeowners find the right price, the “technology-powered real-estate brokerage” Redfin today launched a new tool that allows potential sellers to get feedback on their price before putting their home on the market. 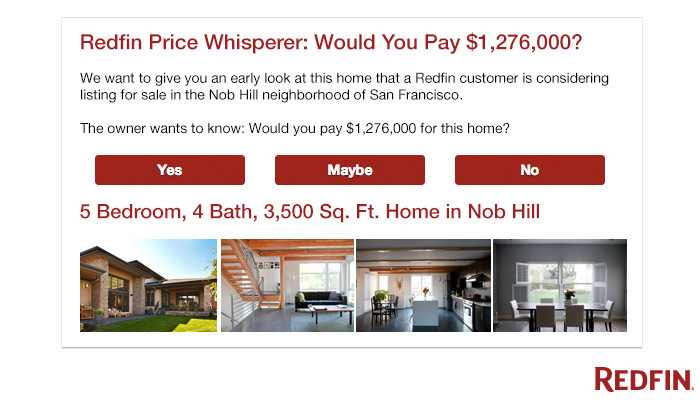 Redfin’s new Price Whisperer tool allows sellers to get feedback on a price and demand from up to 250 active buyers in their area. The homeowners simply provide their local Redfin agent with their desired price and home address, so there is definitely a lead-generation aspect for Redfin to this as well. The agent then asks the homeowners for photos of the house and sends out an email to potential buyers, asking if they would pay the price for the house. The exact location of the home remains undisclosed at this point. After two days, the homeowners get a report that tells them how many people would buy their house at this price and how many potential buyers would want to tour their place. It’s worth noting that homeowners do not have to list their homes with Redfin to use this service. If they do so, however, the Redfin agent will immediately alert those potential buyers who expressed an interest in the home. In addition, Redfin says, it always recommends that homeowners also list their homes with the Multiple Listing Service to expand the range of potential buyers. The service is now available in Boston, Chicago, the Los Angeles area, New York, Portland (OR), San Diego, the San Francisco Bay Area, Seattle and Washington D.C.